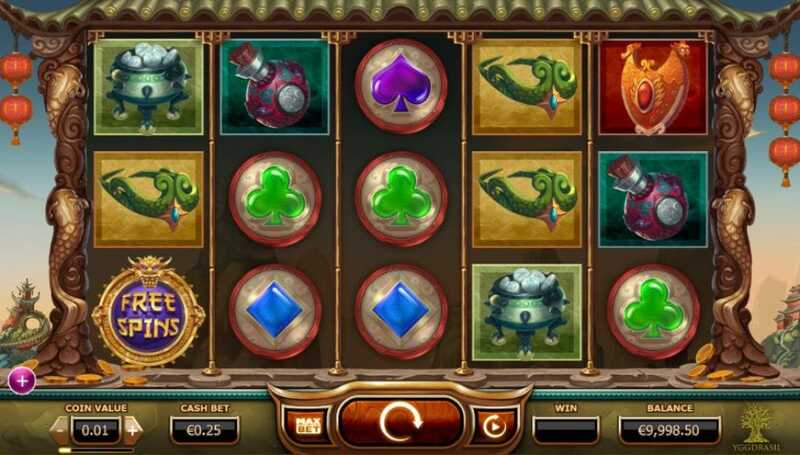 Here's a superb online video slot game from Yggdrasil. Yggdrasil is slowly growing their popularity and if this game is anything to go by, they are slowly climbing up the ranks in the online slot world. The Legend of the Golden Monkey has the main star- a notorious, but a brave climbing monkey who is the king. Think something along the lines of Caesar from Planet of The Apes. If you love promo's don't forget to check out our slot bonus spins. The game has 5 reels and 25 lines. Once you get into the game you have the reels set in an Oriental town. The reels are held by pillars of golden poles with ancient looking patterns. The controls lie at the bottom of the screen together with the autoplay feature and paytable. The Legend of the Golden Monkey symbols includes a snake headdress, purple scroll, amber shield, a pink potion bottle, an ancient golden pot, ruby heart, blue diamond, purple spades, green club, etc. Other symbols include a treasure chest and the golden monkey wild. It’s an exciting feeling to know that as you play you are making your way to the non-progressive jackpot that multiplies your stake by 250x. This special prize is awarded to anyone who spins 5 similar ancient golden pot symbols. The second highest symbol is the silver pot with silver coins, that has a prize multiplier of 200x. The purple scroll multiplies the stake by 150x. There are certain symbols in the game that will activate special features. Sticky Wilds- If you get a win when a wild Golden Monkey appears on your win line, this wild stays in position for the next spin. It will continue ‘sticking’ there the more you win with it. Golden Monkey - The Golden Monkey appears randomly and substitutes any symbol on your reel in the hopes of helping you form a winning combination. Treasure Chest - The treasure chest appears on the 5th reel and comes in handy during the base game or free spins. In the previous, the chest appears on the screen and activates free spins or wins of up to 1000 coins. Players can win up to 1000 coins during the free spin round or gain 2 extra spins. Free Spins- You can get free spins by activating 3 golden and purple free spin symbols on the reels. The more you activate, the higher your cash reward. In the free spin mode, you’ll have to choose from three types of spins and wilds namely incremental, stacked and starting wilds. Incrementals have 6 free spins and a sticky wild. 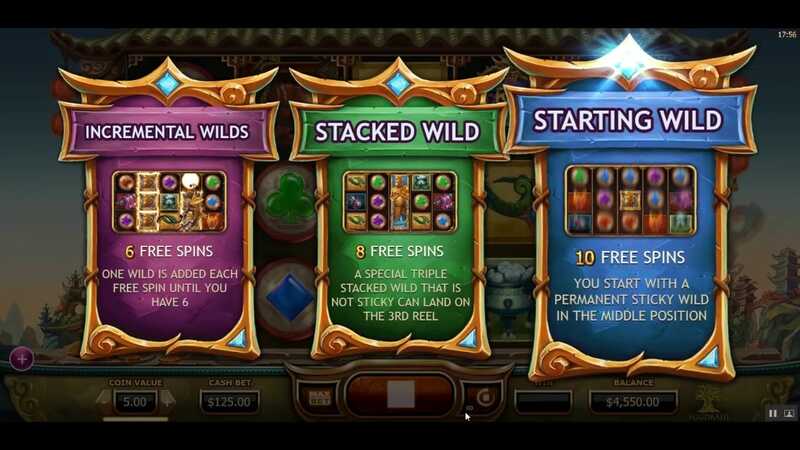 Stacked have 8 free spins, a sticky wild, and may not appear. Starting ones have 10 free spins and a permanent sticky wild. This game has a high likelihood of return of 96%. Once you play it you will be hooked by the variety of potential wins as well as the concepts of wilds. Try it out today and see if you can win on The Legend of the Golden Monkey. If you enjoyed Legend of the Golden Monkey then you might also like Fairytale Legends Hansel and Gretel.